Ammonia removal in cold weather can be challenging. 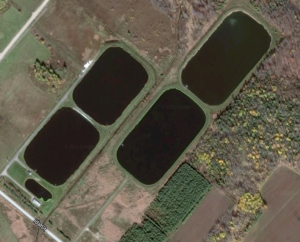 A sewage lagoon system in a growing Ontario community is aiming to consistently achieve regulatory compliance for ammonia removal year-round, even when wastewater temperature is low as 1ºC. By fitting its wastewater treatment lagoons with BioCord™ Reactors, whose condominium-like design helps cultivate a massive colony of desirable microbes to enhance year-round ammonia removal, especially during challenging winter conditions. Ammonia removal becomes more difficult for lagoon systems during the winter months because the microbes that provide nitrification slow down and even die off in the cold conditions. BioCord’s open-frame design allows superior treatment in cold weather because it ensures good circulation and inhibits air diffuser clogging due to sludge build up. Densely looped polymer fibres, which are hung on modular frames, provide a massive surface area for growth of aerobic and anaerobic microorganisms that are ideal for helping treatment lagoons maintain regulatory compliance for ammonia in cold weather conditions. BioCord can also be used to reduce other common wastewater constituents such as BOD and COD. A grant from the Southern Ontario Water Consortium’s (SOWC) Advancing Water Technologies Program is supporting a partnership between Bishop Water and Western University to optimize the size, quantity and operation of the BioCord Reactors being used at the Dundalk WWTP. The team regularly collects data on specific performance parameters, such as ammonia, for evaluation. The monitoring and data analysis will not only help optimize the BioCord system at the Dundalk WWTP, it will also contribute to the overall knowledge base that can be applied to other BioCord installations as well. Watch this video to learn more about our BioCord pilot project in Dundalk, Ontario. Learn more about BioCord Reactors for Ammonia Removal.